October 1938, and foreign correspondent Jack Telford is on the run in northern Spain, territory now controlled by Franco's fascists. And he's killed somebody close to the Generalisimo's heart. Telford's a hunted man, and hunted by three different and deadly enemies. In a climactic chase from Madrid to the Republic's last outpost, in Alicante, during the closing days of the Spanish Civil War, Jack will learn hard lessons about the conflict between morality and survival. David Ebsworth is the pen name of writer Dave McCall, a former negotiator for Britain's Transport & General Workers' Union. He was born in Liverpool but has lived in Wrexham, North Wales, with his wife Ann since 1981. Following his retirement, Dave began to write historical fiction in 2009 and has subsequently published five novels: political thrillers dealing with the 1745 Jacobite rebellion, the 1879 Anglo-Zulu War, the Battle of Waterloo, warlord rivalry in sixth century Britain, and the Spanish Civil War. 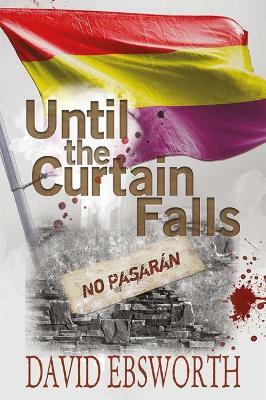 This sixth book, Until the Curtain Falls returns to that same Spanish conflict, following the story of journalist Jack Telford who, as it happens, is also the main protagonist in a separate novella, The Lisbon Labyrinth. Each of Dave's novels have been critically acclaimed by the Historical Novel Society and been awarded the coveted B.R.A.G. Medallion for independent authors. His work-in-progress is a series of a further nine novellas, covering the years from 1911 until 1919 and the lives of a Liverpudlian-Welsh family embroiled in the Suffragette movement.